There are many unknowns when you have a premature baby. Will there be NICU time? Will your baby be behind developmentally or will they meet regular milestones? And what about growth spurts and wonder weeks? There are many things I could talk about regarding this topic, but today I want to focus on how to handle the wonder weeks with a premature baby. First off, what the heck even are the wonder weeks and why does it make a difference if your baby is born preterm? I’ll explain both! The Wonder Weeks is a term coined by two Dutch doctors, Dr. Frans Plooj and Dr. Hetty van de Rij. The Wonder Weeks are used to describe mental leaps in a baby’s development. You can think of leaps as growth spurts, but for the brain. When your baby is going through a ‘leap’ it is because something new is going on in their brain and it will lead to them developing a new skill. Unfortunately, it also causes a lot of fussiness. It’s as if your baby suddenly sees the world in a whole new light, and that is scary! It’s also probably very frustrating for your baby to not have control over something they used to have control over. Although the fussiness caused by leaps can be tough, it’s so worth it to see your baby learn new skills. Read more about the Wonder Week book at this link. Find more information about Leaps and Milestones at this link. Wonder weeks occur between 4 weeks and 20 months through your babies life. 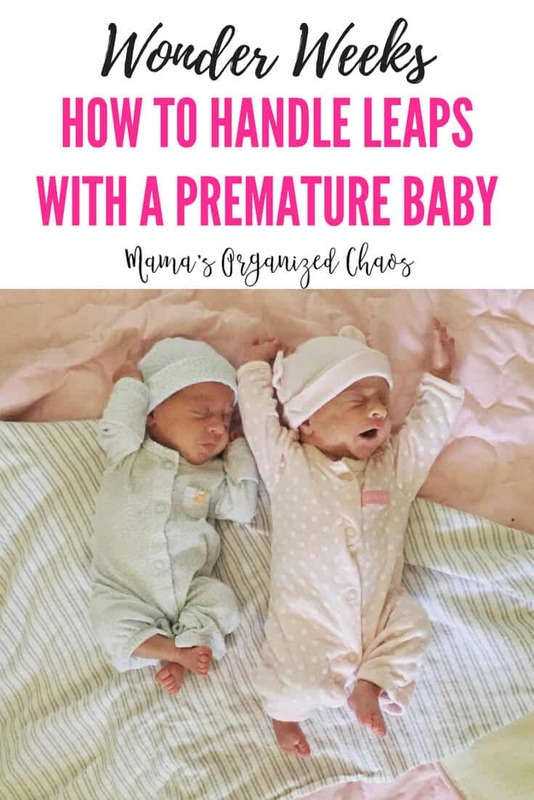 Leaps can typically happen up to a week early or late because babies brains grow at different speeds and estimated due dates could be off as well. The weeks are just an estimation to go off of, although they were extremely accurate with my singleton! The actual date of the leap is based on the babies adjusted age. The adjusted age is how old your baby would be if they were born on their due date. So technically, on paper, your premature baby will experience the wonder week leaps on the same date as if they were born full term. If your baby is 4 weeks premature, they will experience leap 1 around the actual age of 9 weeks instead of 5 weeks. This is 5 weeks past their due date. It can be confusing but the science behind it is simple: a preterm baby’s brain isn’t going to be fully developed. My twins were 8 weeks early, and at 8 weeks old, still acted exactly the same as a day old newborn. Actual age vs. adjusted age was confusing to me when my girls were first born, so I’m going to put it right here in bold letters! Actual age is how old your baby actually is. Adjusted age is the age based on your baby’s due date. Since my girls were born 8 weeks early, at 10 weeks their actual age was 10 weeks but their adjusted age was 2 weeks. You can read the wonder weeks book (click here to view the Wonder Weeks book on Amazon) or download the app to see the complete timeline of leaps, and fantastic tips on how to handle them. You can read all of the scientific information in the world, but nothing compares to real life experience. My singleton was full-term (actually, he was 4 excruciating days late!) and he hit the wonder week leaps right on the dot. 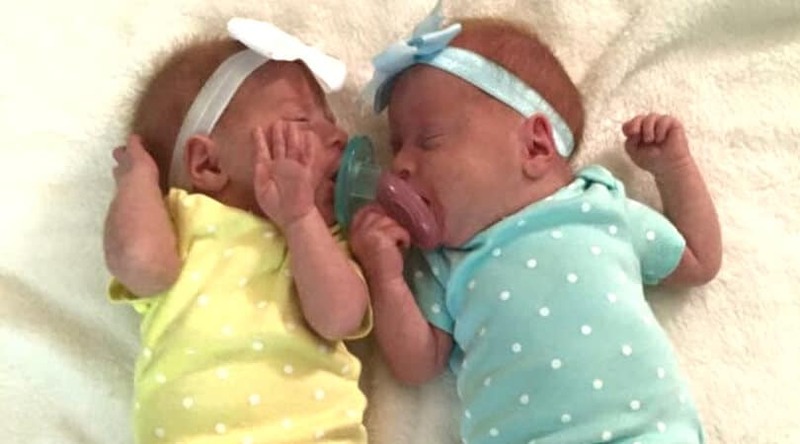 My twins were born 8 weeks early and spent just under 3 weeks in the NICU. Right around their due date, I plugged their information into the Wonder Weeks App. I fully expected them to hit their leaps right around their adjusted age because everything I read said that the leaps were based on adjusted age. While my girls experienced the fussy part of the leap early, they typically didn’t master skills anywhere close to the leap. It took them a really, really long time to master new skills. If you have a preemie and are concerned about their development, please try not to worry! Take them to any developmental follow-up appointments that are suggested and continue to work on things, but don’t stress it if they aren’t reaching their milestones. When I was pregnant with my twins, a fellow twin mom gave me a really good tip. She said that premature babies will be behind developmentally until around the age of two. This was definitely the case with my girls! At their two-year checkup, they were meeting all of the milestones of a two-year-old, and were even ahead in speech! 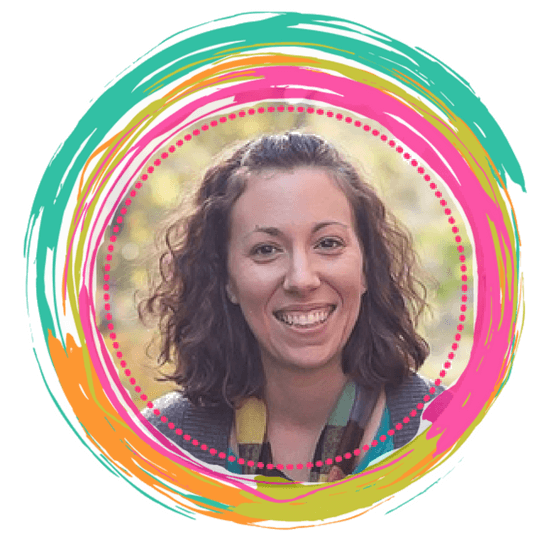 Our Guest post blogger today: Caitlin is a stay at home mom to three little ones, identical twin toddlers, and a preschool-aged boy. She blogs about all things twinning and parenting over at www.TwinMomandMore.com. You can also follow her on Facebook and Instagram!